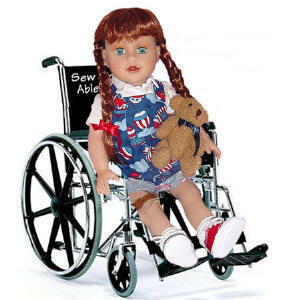 Doll Clothes - American Girl Doll Clothes, Doll Shoes, Furniture and Accessories For 18 Inch Dolls, Disabled Dolls and More! New Items Added *Updated* 05/01/2018 * For ALL 18" PLAY DOLLS! Doll Shoes, Furniture & Accessories! See how easy it is to order doll clothes online from Sew Dolling®LLC ! 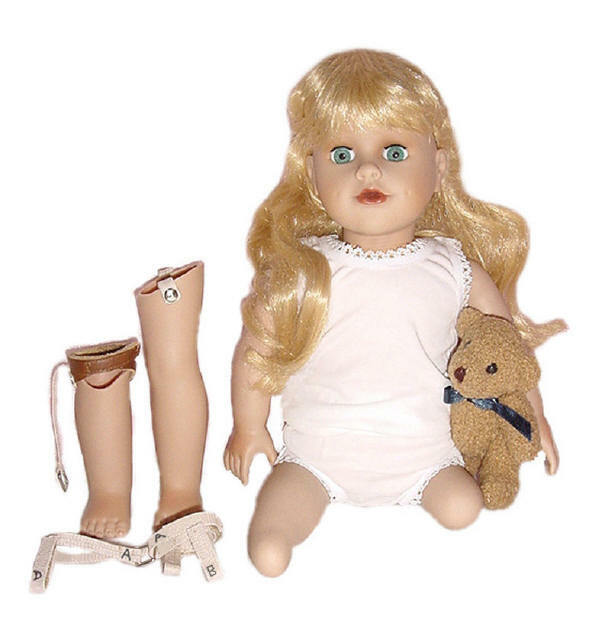 Great Doll Items for almost every 18" Doll ! Isn't It Time There was a Doll As Special As YOU?!! Sew *ABLE* Dolls® are Special like you! 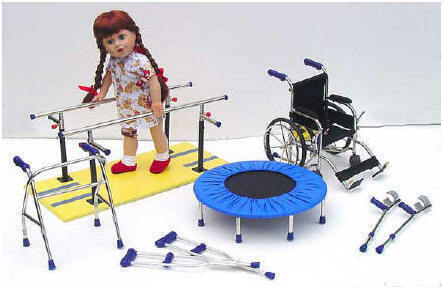 Doll-Sized Physical Therapy Equipment Now Here! Special "Sew ABLE ®" 18" Dolls have arrived! Check them out on the SEW ABLE® Webpage! More Doll Clothing from Dolly Sew Casual.& School Clothes, Dolling Shoes, New Kitchen, New Outfits, Even Boy Dolls and great clothing made especially for the Boys! Browse our site for great American Girl® doll clothing, accessories and more!! Sew *ABLE* Dolls are IN the MOVIES!! Our Dolls and Physical Therapy Equipment just made it to the Big Screen! What a wonderful gift to give a child to let them know how special they really are. Isn't it time there was a doll out there like this? Too many toy manufacturers have decided this type of doll was far too expensive to produce for the profit they would make. This is true as this doll is not your typical vinyl doll. Each of the play therapy dolls with prosthetic legs have been specially fitted with both an above knee and below knee prosthesis and have been carefully designed to look as real and natural as possible without jeopardizing the safety or play factor. "This is how I put my leg on"
The dolls with prostheses all have an above the knee and below the knee amputation. The dolls without hair will include a wig and a hat to wear if they choose. 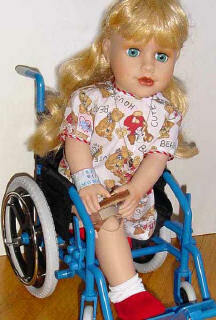 All of the play therapy dolls will include crutches in their box as well as a teddy bear. The faces were delicately hand-painted and given cute little dimples in their cheeks. Because the cost to produce these dolls was high, they are limited in number. This will make them highly collectible ~ some have only 172 in their edition. We believe the expense put into the doll is well worth it if it can help one child feel accepted! This is also a great way to help other children who have friends, classmates, or siblings with disabilities to understand that we are all different, special and unique! Doctors have the major role in improving the physical well-being of the child. Family and Psychological support and play therapy are also extremely important to help the child build their sense of self worth. They may long to see other children who look like they do but this is not always possible. These dolls are offered as a supplement to help them in their journey. The name "Sew ABLE®" was chosen because the term "disabled" often separates children from their friends at a time when they NEED to feel accepted and "able." They are all too aware of the things they feel they cannot do, it's very important for them to believe in the things that they can do. We hope you enjoy them! We have had a fun and often worrisome few years designing these to be ready ONE DAY! That day has finally arrived! We believe God has had a hand in this all along! I would like to thank all the people who have helped us in the process. The design of the prosthetics was molded by a children's orthotics and prosthetics specialist (on the other side of the country) who did not even know who I was when he offered to help. Thank you Jon Batzdorff, CPO. The beautiful box design was graciously given by a wonderful Christian man and business owner. Thank you Mark Schraer! The inside of the box design was made by my mother and me on the floor of our sewing room. Thanks Mom! The patience and hard work in a country half a world away was organized by a very special and talented doll maker. Thank you Penny!! And lastly, I cannot forget my father who has listened to all my ideas and really understood why this doll was important. Without the help of all of these people, none of this would have ever been possible. Thank you most of all to God! 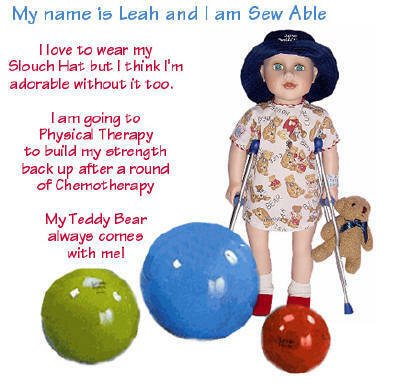 Check them out on the SEW ABLE® DOLLS Webpage !! *Note - These limited edition dolls are very specialized and difficult to produce and therefore more complex than other 18" dolls on the market. They can stand with crutches and most of the time they can even stand without crutches. By helping them learn to balance, you can teach them how to stand on their own. Don't forget to teach them how to put their legs on tight. 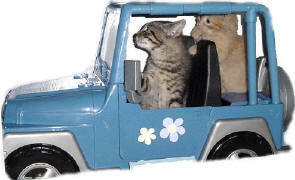 There are instructions on the "Sew Able® Dolls™" webpage and also in the cool box they will come in. They will Not be available in the retail stores. 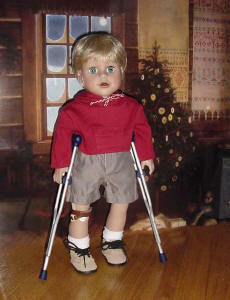 We also have some boy dolls! Doll Clothes that fit American Girl® or Lee Middleton® Dolls! Featuring doll clothes, doll accessories, doll furniture and much more for American Girl® Doll, Lee Middleton® Doll, and Baby® Dolls or other 18 - 21 inch dolls their size. We are not affiliated with the American Girl® Pleasant Company or Lee Middleton® Lee Middleton® Dolls, Lee Middleton® Dresses, Furniture & Doll Accessories. Click Here to find out how you can receive a surprise gift with your order! 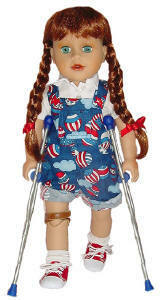 Thank you for Visiting Sew Dolling® Doll Clothes and Accessories for the American Girl® and 18 inch dolls. Please take a look at our new Sew Able® dolls, great for Play therapy and all the wonderful doll furniture we have. 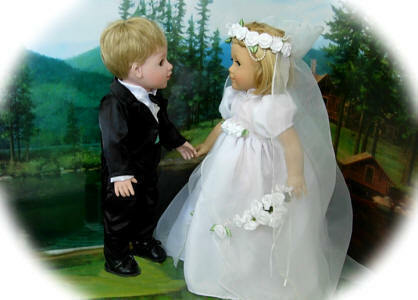 Not to forget, we also have the popular Lee Middleton® dolls and doll clothes and shoes that fit them! We are not affiliated with the American Girl® Company. Don't forget to bookmark the site! It is always changing.